Eighteen-year-old Celaena Sardothien is bold, daring and beautiful – the perfect seductress and the greatest assassin her world has ever known. But though she won the King’s contest and became his champion, Celaena has been granted neither her liberty nor the freedom to follow her heart. The slavery of the suffocating salt mines of Endovier that scarred her past is nothing compared to a life bound to her darkest enemy, a king whose rule is so dark and evil it is near impossible to defy. Celaena faces a choice that is tearing her heart to pieces: kill in cold blood for a man she hates, or risk sentencing those she loves to death. Celaena must decide what she will fight for: survival, love or the future of a kingdom. Because an assassin cannot have it all . . . And trying to may just destroy her. Please note: This is my review for the second book in this series, and so contains spoilers for the first, Throne of Glass. You may wish to read my review for that book instead! I loved Throne of Glass when I read it last year, so I was desperate to get my hands on Crown of Midnight. I am so, so glad that it not only didn’t disappoint as the second book in the series, but in fact was even more awesome than the first! Calaena Sardothien has won the contest and been named the King’s Champion. Her job is to carry out the King’s Justice, to kill those who displease him, but Calaena secretly refuses to kill at the King’s order. She must find out about a secret plot against the crown before time runs out. Meanwhile, strange things are happening at the glass castle of Rifthold – dark hooded strangers stalk the library and bronze doorknockers take on a life of their own. What new terror is lurking in the dark places of the castle? This second book shows great polish with its perfectly constructed pacing – quiet yet steady in the creepy parts, building up to some fantastic action scenes later in the book. There are the sort of swoony passages that make you want to re-read sections over and over. I loved Chaol in the first book and wow, do I love him even more in this one. Dorian also has interesting developments throughout this story and I’ll look forward to seeing how his story plays out from here, however for his father the King, I am beginning to have Joffrey-esque levels of dislike. In some ways, there are two distinct sections to this book. The first half is almost like a continuation of Throne of Glass – plenty of gorgeous romantic scenes and mysterious intrigue, then BAM – right in the middle, murder, betrayal and chaos reign for pretty much the rest of the story. Without spoiling anything, I was really surprised and a little upset by the unexpected turns but I couldn’t put the book down until I’d got right to the end. Fantastic writing and such heartbreaking scenes, even if I did want to slap Calaena at times for keeping everything to herself and not sharing any of her burdens. And oh, my god, the twists right at the end – I had my suspicions but wow, what a set up for the next book! There are currently six books planned in this series (according to Goodreads), not to mention the several novellas that have been released featuring Celaena’s adventures (which, I have just discovered, are now available in Australia – *yoink!*). It’s going to be a long, impatient wait for the book three. I’d recommend these books to those (not just young adults) who love a slightly eccentric, kick-arse heroine, swoon-worthy romance and some fast-paced and occasionally rather creepy action. If you haven’t read Throne of Glass yet, I’d encourage you to give it a go! 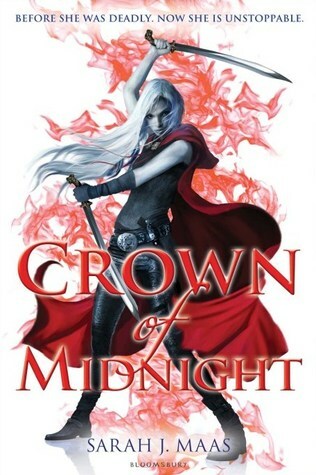 What did others think of Crown of Midnight? YAY I don’t know anyone who didn’t absolutely love this. And SIX BOOKS, so happy to here that. I have the novellas to read too, might put them on my Bout of Books pile for next week. Thanks 🙂 I don’t think I saw any negative reviews for this one at all!